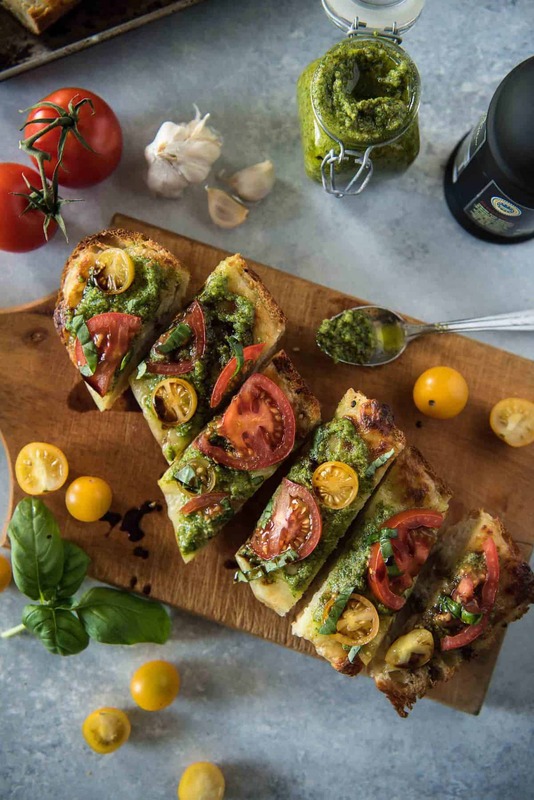 Whether you pair it with your favorite pasta dish or call it dinner by itself, this Caprese Garlic Bread with Arugula Pesto will please the palate of any lover of Italian cuisine! Hello hello, beautiful world! It’s so nice when your entire outlook on life does a 180, isn’t it? 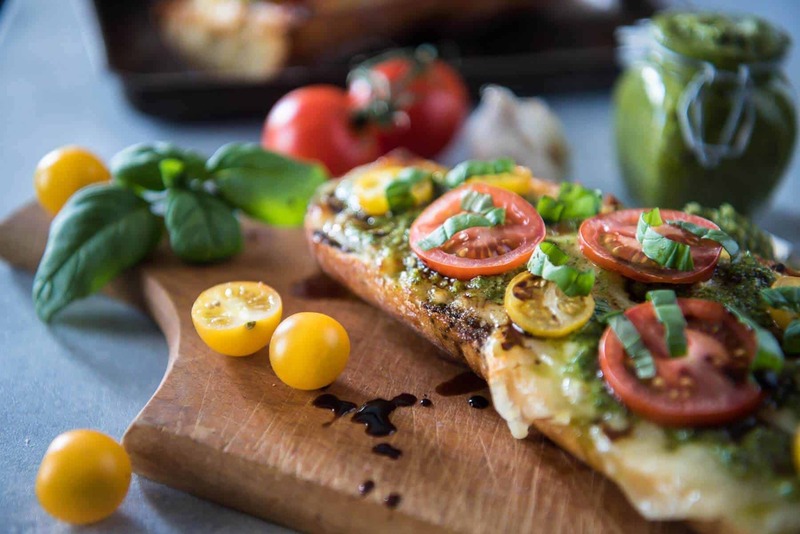 Let’s just say that this Caprese Garlic Bread is the all-grown up version of those. And…arugula pesto! Because it just seemed fitting. And because I accidentally bought too much arugula and, while it’s my fave green thing in the world, I actually cannot eat salad more than once a week. I just can’t. 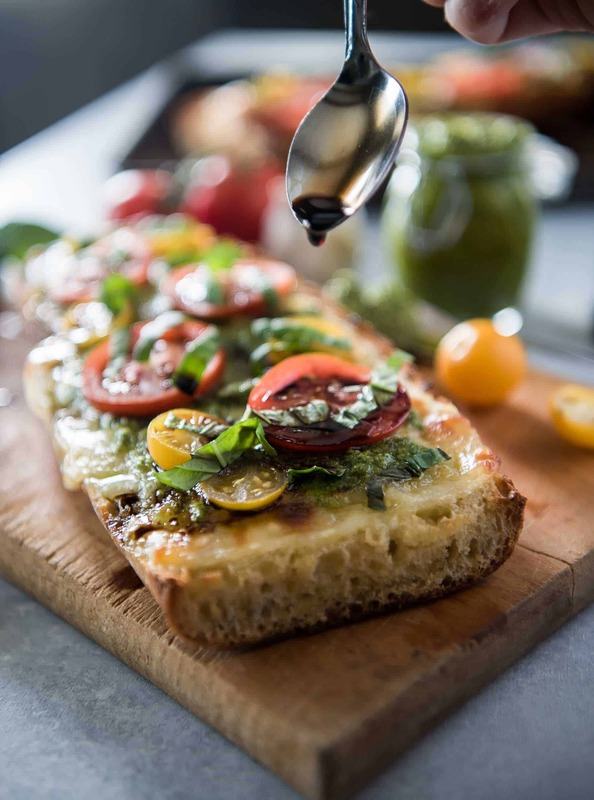 So instead – Caprese Garlic Bread with Arugula Pesto. AKA fancy salad garlic bread pizza! Sort of. 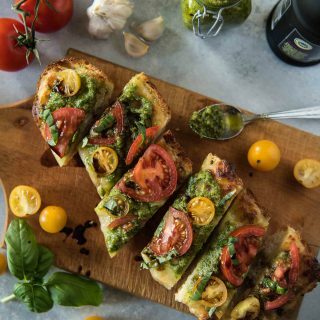 This idea went from being plain old caprese to a caprese flatbread to what you see in front of you minus the pesto, the decision finally being set in stone when I looked in my shopping cart and realized how much my grocery bill was about to be. This week’s Sunday Supper theme is “Fresh Tomatoes,” and I waited until the last minute deciding on what I was going to contribute (which is pretty unlike me,) so something simple was definitely in order. I’ve been bogged down with work (at BOTH of my jobs – I’m hustling both of them until the end of April,) so my recreational motivation and recipe inspiration levels have been just awful. It’s been one of those pass out in the first 5 minutes of Friends every night kind of weeks. That’s not to say that I couldn’t down a slab of this easy, scrumptious garlic bread every night for the next month before collapsing from exhaustion. I’m pretty sure I could find the strength. I mean, crunchy toasted bread, soaked with garlic butter? You could have sold me right there. But don’t stop there – add mounds of melty mozzarella cheese. Peppery arugula & pesto – as much or as little as you want. Sweet tomatoes, tangy aged balsamic, and a touch of basil. At least the food coma will be a good one, full of delicious dreams. Complaints and carbs aside, I’m seriously counting my blessings right now. I’m about to enter a world where all those little blogger dreams I’ve had are a very real and reachable possibility. I’ll take a few weeks of smacking the snooze button a few extra times in exchange for the literal freedom I’m about to have. See? Prayers do get answered, whether in the form of a life-changing event, or a life-changing recipe. In this case, I call a win-win on both fronts. Preheat oven to 400 degrees F. Place both halves of the baguette on a large baking sheet, cut sides up. In a medium bowl, stir together softened butter and garlic. Spread evenly on bread halves. Completely cover the top of the bread with slices of mozzarella cheese. Bake for 12-15 minutes or until the cheese is melted, turning the broiler on high for final 2 minutes to brown the cheese slightly. While the bread is in the oven, make the pesto. In a food processor, combine the pecans, garlic, arugula, cheese, and 1 teaspoon of salt; pulse to blend. With the machine running, drizzle in the olive oil in a slow, steady stream and blend until smooth; scrape down the sides of the bowl as needed. Taste and adjust salt as desired. After removing the bread from the oven, top with desired amount of pesto, then layer on tomato slices. Season with salt and pepper to taste and add the fresh basil. Drizzle with balsamic vinegar, slice, and serve. Tomay-to, Tomah-to – no matter how you say it, our Tastemakers have got you covered when it comes to these beautiful, confused little fruits! OMG! This is incredible. Your photos are making my mouth water! Seriously this is perfect! Yum. That looks so good. Your photos always make me hungry. Alas I have no mozzarella cheese in the fridge right now. I kind of go on spurts between having it and using it and then not using it. And then throwing it out or feeding to the dogs! I could definitely eat a lot of this gorgeous bread—any time of day!! I’ve got a gluten free baguette in the freezer, I think I know what I’m going to use it for now. yum! I’ll be serving this garlic bread next time I serve up some pasta. Looks soooo good with all those colors, flavors, and textures. That looks amazingly good. Thanks for sharing. This looks delicious! I can’t wait for tomatoes to be in season in NJ so I can make this! 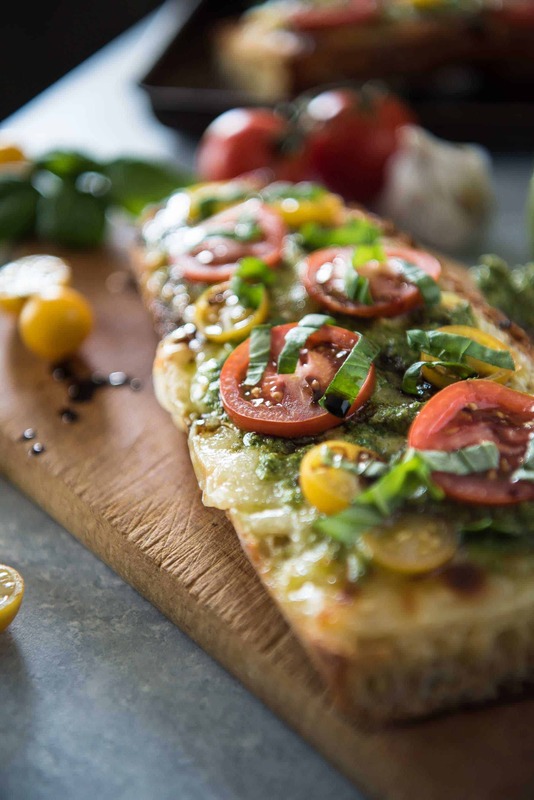 Oh this is so much better than the usual French bread pizza! I love arugula pesto, it’s what I make most often and the rest looks great too. This turns garlic bread into a MEAL! Love it! 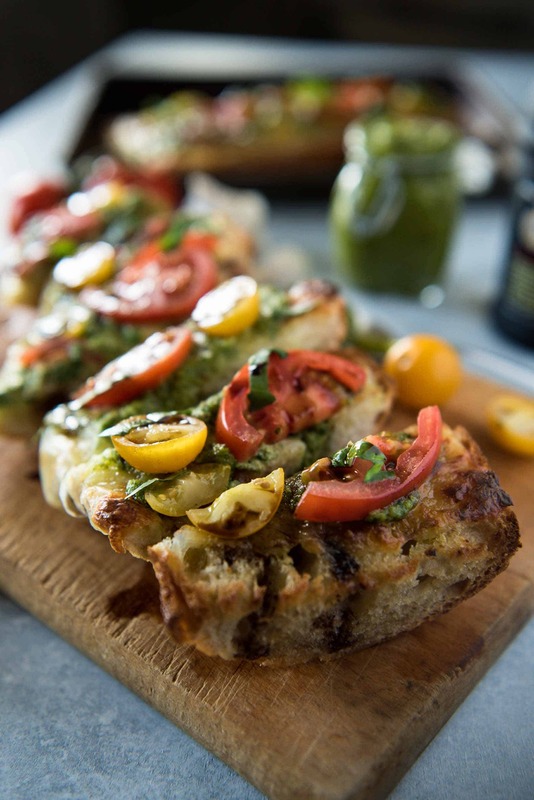 I like your grown up version of French bread pizza! Hearty and flavorful! This sure is a win-win recipe and I can’t wait to make it for Baby Boy and me!! Sharing on Desserts Required’s FB this weekend. Hey Erica! I’m stopping by different blogs of other bloggers who are attending EFC and saying hi! Ummmm… this bread looks so delicious! 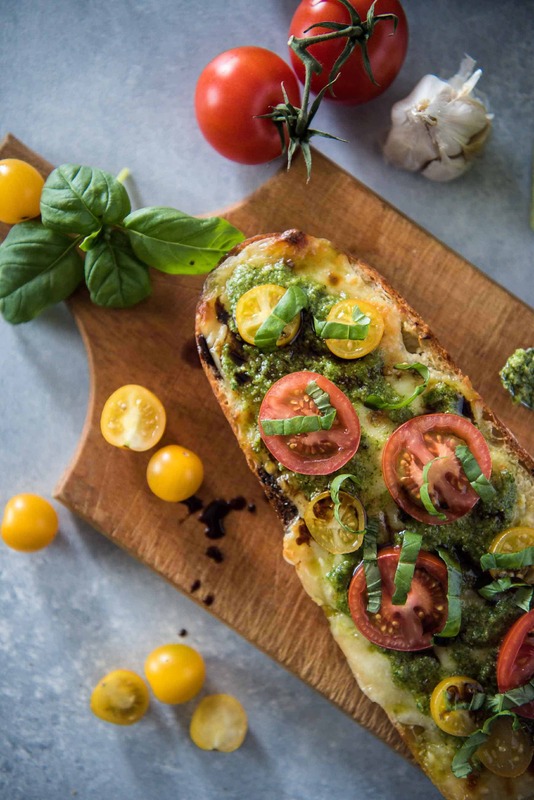 I have a pesto recipe I would like to try it with! The balsamic is truly making my mouth water. Hope to meet you at the conference!